Fuji Depot 6ft. 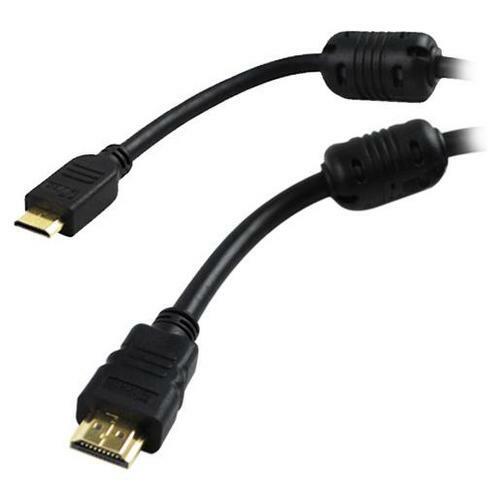 Mini HDMI Gold Plated Connector Cable with Ethernet & Ferrites. HDMI Ethernet Channel: HDMI Ethernet Channel technology consolidates video, audio, and data streams into a single HDMI cable, combining the umatched signal quality and convenience of HDMI connectivity with the power and flexibility of home entertainment networking. A premium quality HDMI- HDMI mini cable suitable for use with camcorders. A superb cable with excellent audio-visual transfer properties that deliver signal without compromising purity and balance. Brand new high quality gold plated cable. Cable constructed using the high quality material for best contact connection between HDMI equipment. Cable length: 15 feet. Connect your portable HDTV DVs, Camcorders, Cameras or Game Consoles to your HDTV. Connectors: Mini HDMI Male to HDMI Male. Features gold-plated connectors, molded strain-relief, and mylar-foil shielding. Supports 480i, 480p, 720p, 1080i, 1080p, 2160p resolution.